Friday October 21st 1898 Mary and harry went down to Ed Mc-- for dinner. It was a very ugly chill day. Soon after dinner Will and I went down there for then and took them to town. It was nearly night when we got home. 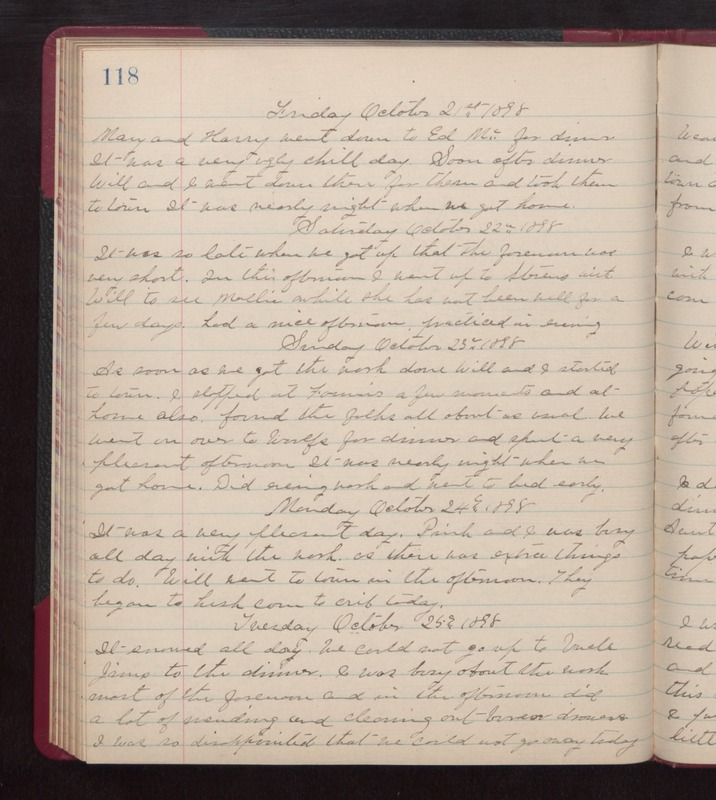 Saturday October 22nd 1898 It was so late when we got up that the forenoon was very short. In this afternoon I went up to Stevens with Will to see Mollie awhile she has not been well for a few days. had a nice afternoon. practiced in evening. Sunday October 23rd 1898 As soon as we got the work done Will and I started to town. I stopped at Fannies a few moments and at home also. Found the folks all about as usual. We went on over to Woolfs for dinner and spent a very pleasant afternoon. It was nearly night when we got home. Did evening work and went to bed early. Monday October 24th 1898 It was a very pleasant day. Pink and I was busy all day with the work as there was extra things to do. Will went to town in the afternoon. They began to husk corn to crib today. Tuesday October 25th 1898 It snowed all day. We could not go up to Uncle Jims to the dinner. I was busy about the work most of the forenoon and in the afternoon did a lot of mending and cleaning out bureau drawers. I was so disappointed that we could not go away today.